1. My last meal as a New Yorker: As the terrific friends who I met and grew with during my years in New York came in from the January cold to John's Pizzeria, my favorite pizza shop, the waiter continued to add extra chairs to our table. Though many goodbyes were said that night, amidst the bittersweetness a happy discovery was made, and a new tradition begun: the meatball and garlic pizza. I was always a toppings purist when it came to eating at John's, but a smart foodie friend asked the waiter what he recommended, so we ordered one pie with meatballs and garlic. And then another. And maybe a third. In spite of the cold, as was always my tradition, the pizza was followed by a stop next door at Cones for gelato. 2-3. First Parkway Bakery po-boy, and a slice of King Cake: Less than two days after my John's goodbye dinner, Jon picked me up at Louis Armstrong airport and whisked me to Parkway for a po-boy. I washed the warm, well-fried oyster, mayo, lettuce, and tomato sandwich down with root beer, and another new tradition, of root beer with po-boys, was formed. I've since discovered that root beer is very popular in New Orleans, which makes the city even more popular with me, as it's always been my favorite soda. Next we went to a thrift store, where I found a 70s-style outfit to wear later that night to a friend's Mardi Gras-themed wedding. After the traditional church ceremony, everyone changed into costumes, and we danced to Iko Iko and did the Second Line, beads swinging, white napkins waving. 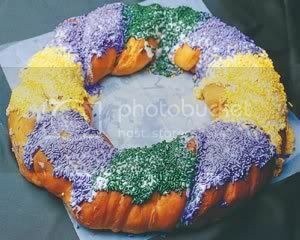 From the buffet, I ate pieces of sweet, sticky, glistening King Cake, which is a dessert associated with New Orleans, mostly during Mardi Gras. During the years that I worked for the travel magazine, the New Orleans Tourism Bureau sent copious King Cakes each Mardi Gras season. Of all my co-workers, I was the one who especially liked them, which I'll take to be one of the signs that I was meant to live in New Orleans one day (and/or that I have a very sweet tooth). 4. My first Sazerac: Whoa, Nelly. All I need is one, and I'm seeing double. Two, and I might be on the floor. Come to think of it, I should probably only drink two of these whiskey, bitters and anise liquor-heavy drinks per year. This year, my first was at La Petite Grocery, and my second was at The Columns. It's definitely time to start thinking about where to imbibe my first Sazerac of 2009. 5. Beef Jerky on my wedding day: On my wedding day, the starving bride-to-be, plus a bag of buffalo beef jerky equaled an energized bride, and a new appreciation for canine teeth. I'm sure I looked quite odd chomping on the jerky in my full wedding hair and makeup at the salon while waiting for my Maid of Honor's hair to set! 7. Greek Shrimp (click here for recipe): This was Jon's favorite meal I made in 2008, though my recent dinners of Macaroni and Cheese and Roasted Salmon with Yams, Swiss Chard, Cabbage, and Red Wine Sauce (from Bon Appetit as well) were similarly savored. I first made the shrimp to celebrate a friend's birthday at our house, and then I made it again a few weeks later when my Dad visited. The dish is savory yet sweet and gives you that warm, cozy, everything's-gonna-be-alright feeling. 8. Pepitas: It's so simple: heat up a pan with olive oil, throw in your green, hulled pumpkin seeds (pepitas), s alt and pepper them, and stir frequently until they start to pop. It's up to you how dark you want them, and also how you serve them. Ground to become pumpkin seed pesto? In a salad? As a snack, maybe sprinkled with curry powder? They're simple, healthy, tasty, and my new favorite ingredient.